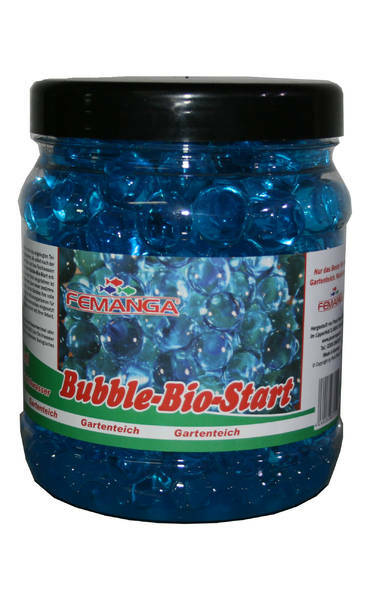 Bubble-Bio-Start ist eine einfache und optimale Lösung zum Einfahren von neu angelegten Teichen undFiltern. Bubble-Bio-Start wird über einen bestimmten Zeitraum in einer sogennanten >Mikroorganismen-Suppe< getränkt, bis die Bubbles ihre volle Größe erreicht haben. Eine eingebrachte Sauerstoffversorgung hält die Mikroorganismen für einen langen Zeitraum am Leben. Bubble-Bio-Start kann auch zum schlammabbau eingesetzt werden . Die Bubbles werden einfach in den Teich gegeben und beginnen sofort mit Ihrer Arbeit. Anwendung: Nach einem Neustart des Filters, einer Teichreinigung, einem Wasserwechsel oder einer medikamentösen Behandlung gebe man 8 Bubble-Bio-Start auf 1.000 Liter Teichwasser direkt in den Filter. Die Wirkung setzt sofort ein und sorgt für ein optimales biologisches Gleichgewicht. Vor Kindern sicher aufbewahren ! Bubble-Bio-Start is a simple and optimal solution for newly sunk ponds and filters. Each bubble contains billions of beneficial microorganisms that are activated immediately after the addition to the garden pond or filter circuit. The filter and the pond water are immediately set up biologically, as minerals and enzymes that are contained in the Bubble-Bio-Start, support the initial treatment of the microorganisms till the pond is retracted and the waste materials can be disintegrated. Bubble-Bio-Start is soaked over a specific period in a so-called "microorganism soup" until the bubbles have reached their full size. The introduced oxygen supply keeps the microorganisms alive for a long period. Bubble-Bio-Start can also be used for sludge removal. The Bubbles are simply added to the pond and immediately begin their work. Bubble-Bio-Start is non-toxic to humans and animals. Application: After restarting the filter, the pond cleaning, water change or medical treatment, add 4 Bubble-Bio-Start to 1000 litres of pond water directly into the filter. The effect starts immediately and an optimal biological balance is ensured.